An authentic chili sauce made using Szechuan sansho pepper and habanero pepper. Enclosed pamphlet contains a recipe for shrimp stir-fried in chili sauce. 240g total (2 bags, 120g each). We make this authentic chili shrimp sauce by utilizing not only doubanjiang, but also the spiciness of both Szechuan sansho peppers and carefully selected chili peppers (habanero). Seasonings such as sauces can be a crucial part of a meal, turning plain food into a delicious experience. After all, sometimes we only think we don’t like certain foods because we haven’t tried them with the right seasoning! Sugarlady’s Viva Chef sauce for chili shrimp and other seasoning products are safe and free of chemical seasonings and additives, letting the true, natural flavors of the ingredients themselves shine – and allowing you to enjoy your meal without worry. How to defrost: Remove the sauce from its outer bag and let it sit in its inner bag, either at room temperature or beneath running water, until it defrosts. Alternatively, defrost using a bain-marie. How to eat: There is a basic recipe (for shrimp stir-fried in chili sauce) on the enclosed pamphlet. 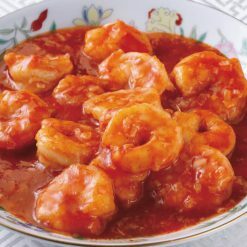 1 bag of the Viva Chef sauce for chili shrimp can be used for approximately 2 servings.If making chili shrimp using 1 bag of sauce, you will need 1 Welsh onion and 200g of shrimp. 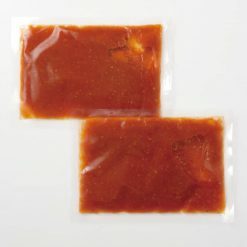 This product contains tomato ketchup, chicken extract, Japanese-style chicken soup stock, doubanjiang, sugar, rapeseed oil, garlic, ginger, tapioca starch, dehydrated Welsh onions, sansho peppers, chili peppers.. This product is not suitable for anyone with allergies to soy or chicken.